The Grand Lodge of Montana put together this chart. It provides wonderful insight on how different generations view the world and how they impact on Freemasonry within the state. How can we attract more Gen X's and Y's to the Fraternity? Much of what we need to do to attract Gen Y's we are already doing i.e. Websites, Facebook, etc. We need to keep our presence updated & fresh. We need to do more to publicize our purpose(s) and be somewhat more open in describing what we do & how we do it. We also need to learn to accept their feedback- something that has been highly lacking (old guys!). I feel most of the "late Boomers" & "X's" are a lost cause, but I'm hopeful that the "Y's" will tend to bring some of the older ones along with them. Just my 2 centavos (soon to be worth more than US money!). and cut the memory work of the EA... ! make the second and third sections optional.. ! You forgot the emoticon on that posting. During Grand Master Jack Kelly's year he made the second and thrid section optional... ! I always wonder if anyone knew how many didn't turn in those two sections...? or if we should allow them to vote at Grand Lodge because you know they are second class masons...? they are just not as smart as the rest of us...? maybe we should look at those who transfer their membership from other Grand Lodges who only learn a small amount of what we learn... ? should we require them to turn in all the work before they can transfer their membership...? or maybe they should have a different colored apron or something to ID them as second class masons...? I disagree with this. My lodge had members that would do the repeat after me Q&A and each year I have to beg these members to pay dues. Most have already gone NPD. The guys we bring in now are starving for this stuff. They are starving to learn what masonry is. They are getting it to. We are growing by the handful each month. We just bought a website and keep it updated. Adding PayPal next month for degree fees, dues, endowments, and donations. We are working on something bigger in the next 6 months. With a members only section in the near future. How about instead of loosing our teaching methods we just show people the door that the ones before me have kept hidden. How do guys my age find out about something? Look on the internet. If your not there then we are not going to go much further into looking. The memory work is not the issue. I joined last year and had always been told there was memory work, so I waited to make sure I had time to do it before I joined. Once I joined and learned the work I was like that is all, I should have done this before. The memory work to me shows the dedication of the individual who begins the journey. The memory work isn't Masonry, but it contains the lessons that are of importance for reflection and enhancement. What purpose is there to shortening the work? To gain members? Well in my opinion if the work is the stumbling block then what does masonry gain from them? It is one of those things that in my opinion weeds out some who shouldn't be, even though they may be qualified. My top line signer made every effort to assist me. He showed up at my office for lunch to assist me, and any time I had a spare moment he was there to help. This taught me some important lessons but more importantly the work wasn't an issue. Generation Y doesn't know anything about us except what they see on the movie screen, books, or via the internet. Most of them may not have had fathers or Grandfathers who were Masons. They may have to go all the way back to their Great Grandfathers who they may or may not have known. Even if they did know them do they remember much? Perhaps by cultivating Generation X you will captivate Generation Y. I'm not really sure how many 18-25 year olds are really ready to accept the lessons of Masonry. Yes there are some but the vast majority of this age group still have alot of growing up to do. I know that at 18 I wasn't ready and am glad that I waited a bit longer(10 years). I'm still learning lessons and can see where the lessons you learn in the EA may be better if you wait till you are in your 50's and 60's and your passions calmed. Then how can a new member say "just as all worthy brothers have done, who have gone this way before me". I don't understand how making Masonry shorter can make it better. I would rather see the Fellow Craft degree work be more detailed. The time in between degrees should go back to 28 days. 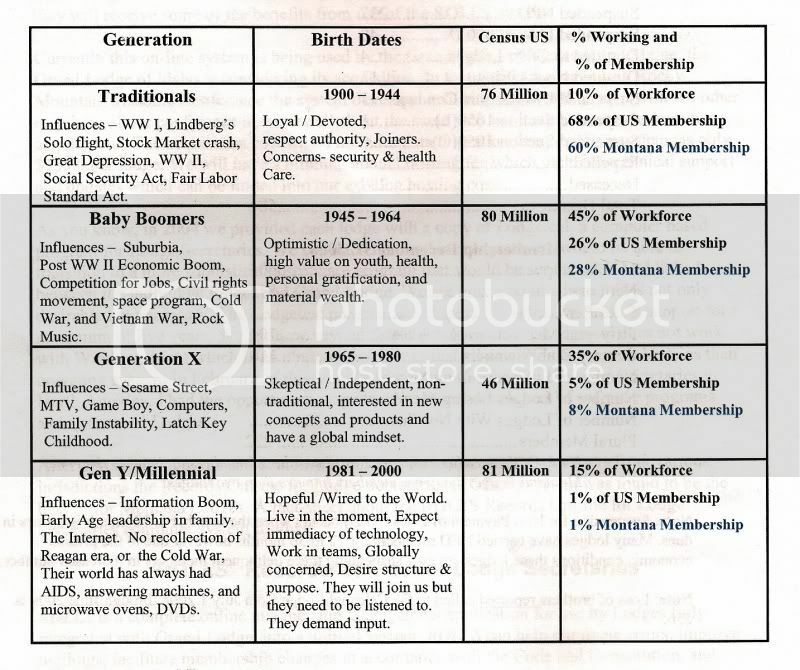 I maybe born a Gen X but when it comes to traditional values of Masonry, I would consider myself a Traditional/Baby Boomer. Sorry for not answering the original question. Being a young Mason I still have not acquired what I can and can't do/say, so I refer to saying limit/nothing and doing nothing with individuals who I believe will make good Masons. When I say acquired I'm referring to personal comfort, I probably revert to the past traditions of the Traditionals generation who believe their actions will be the guiding influence. This has good and bad effects, Good) the people we really need/want are the ones who ask and pursue Masonry, Bad) we miss out on a lot of potentially good Masons. Advertising, I do not mean broadcasting on the big screen. I think we as masons can be our biggest advocates and distracters. I visit a town by the name of Italy about once a month, upon entering and leaving town you will find a sign that has the Square and Compasses on it. This may cause some to ask questions about what it means. When people ask questions we better have done the home work to give answers instead of the people who have no clue(radicals who work off presumptions). My friends know I'm a mason but I do not push the subject. Yes, with some of them I've steered the conversation in those directions or have dropped different comments. Ie. a buddy who moved to Kansas he was mentioning his lack of social interaction in his temporary location, I commented I have a friend in all towns etc. This is about the limit of my comfort zone. If he has questions he can ask, should I be more vocal some would answer yes and some may say I've gone to far. I'm not a sales man and I will never become a corner tabloid sales man for Masonry. While the charities of our masonic organizations have done so much good I don't think we should ever be focused on how to bring people in to keep the stream of money. Instead if we focusing on making Masons instead of card toting members we will see growth in my opinion. Interactions with the community from our members is a good thing and I think if we make Masons we will see those local activities grow. My lodge we have gone from a lodge that was once looking at closing to a lodge that has a fair number of 25 - 55 year olds learning, teaching, and growing. Yeah some would say we are slackers in some areas but in the brotherly love and personal growth I think we are growing and building for the future. the memory work is not the issue. <snip> the memory work to me shows the dedication of the individual who begins the journey. The memory work isn't masonry, but it contains the lessons that are of importance for reflection and enhancement. If thats the case then lets add to it... ! maybe all the work in the montor.. ! if memory work is what makes a mason they we need more of it..? Bro. memory work is not what makes Masonry but it teaches the Mason lessons how to apply Masonry to their life that is to be built upon. To me it shows the dedication they have to the craft. IMO the memorization of, at least, the catechisms are an integral part of the initiating process that sets Masonry apart from all organizations. Memorization is, largely, what imprints on the mind Masonic lessons. Once over lightly, by that I mean no memorization, no Masonic education, no mentoring etc, makes us no different from all other organizations except we wear aprons. Rotary without the regalia. What ever happened to the old adage, "the more you put into it the more you get out of it"?? Speaking of my jurisdiction only, little or nothing is required of the initiate therefore he gets little or nothing out of it. If it gets any more watered down we might as well pass a magic wand over their butts and pronounce them Master Masons. Yes but Missionary is a strange organizations.. ! you can become a Master Mason and never walk back into lodge and live your life per the masonic principles.. ! and be a great mason.. ! there are a lot of masons who choose to work in the Scottish Rite.. etc.. and don't work in the blue lodge.. are they less masons..? I didn't know we were splitting hairs between Blue Lodge and other Masonic Orgs. Less of a Mason? No, but If they take an active part in Scottish Rite/York Rite then they most likely have memorized some parts of it. I don't understand the "Missionary is a strange organizations". As far as the original question, I think time is probably the answer. I was born in 1976, so that puts me in Gen X. My grandfather was a mason, I knew from an early age that I would become a mason. But at the advice of my grandmother, I waited until I was settled down (married, etc.). Generations X and Y are waiting until later in life to settled down in general. I got married when I was 28 and had my first child when I was 32. Contrast this with my grandfather who was married and had kids in his teens and became a mason in his thirties. I think that when theses guys get into their thirties (and beyond), they will be more interested. I always say that the best advertisement for masonry is a mason. So, I think that as more in my generation (X) and Generation Y become masons those they come in contact with (friends, acquaintances, etc.) will join as well. I would like to see some statistics on the age of initiates. Based on the EA degrees I have seen, I would guess that most masons join when they are 35-45 (or 30-50 to be a bit broader). I have seen some younger, but not many over 50. When I say its a strange organization is that we never require anyone to ever attend lodge after they become a Master Mason. In some cases they were military lodges or they moved from their home lodge and didn't transfer their membership.. ! but they were a great example of a Master Mason.. ! and in some grand Lodges they only require they turn in a few questions and answers... ! when they transfer to Texas does that make them less a Mason...? Is Texas Missionary shooting it self in the foot by requiring all the memory work and loosing EA's....? will we ever have the ability to look at whats happing outside of Texas and make changes.. ! or are we just so hard headed that we are doomed...? I think we need to adapt how we look for members. We don't allow Boy Scouts. We don't focus on High Schools. You may say a scholarship but how active are you in programs at the high school. We don't work with local colleges. This speaks for my lodge, but the older members have been struggling with giving up power. They have been in control for so long that now that we are the overwhelming majority they simply have not come back. We did not want that but they have just told us this. For so long our fraternity has been closed to the public. It is time we reinvent ourselves. Jump into technology and embrace change on our image. I can't tell you how many people we get that say they have been wanting to join Masonry for so long but thought they had to know someone or have a family member. Ask your self why. Why did they have this perception? Then look around at what is happening at your lodge and see if you did not know any better what that lodge did. Younger people are no longer getting the core values at home and who better to teach it? We have a good thing going with our principal programs and I have yet to meet a man that has joined that has said had I known that I had to do this memory work I would not have joined. So why do we think this is a deter ant?